This motor unit is another highlight in our newly-launched engine series in 1:18 scale. Encased in a high-quality, dust-proof display cabinet with an acrylic glass cover, it is truly an eye-catching piece of industrial art. As a hallmark of the ingenuity of the Bugatti House, this engine features a design that was ahead of time for 1938. This 8-cylinder in-line-engine is fitted in our famous models known as the Bugatti 57 SC Atlantic Coupé and Bugatti 57 SC Corisca Roadster, including its sport version. 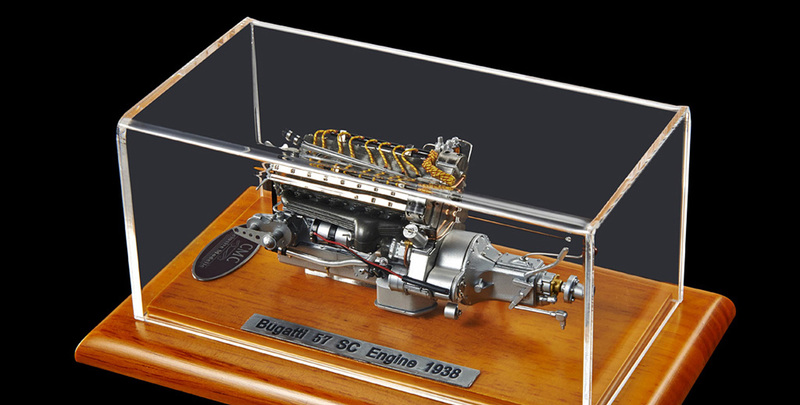 For its internal combustion engines, Bugatti adhered to the principle of “lean and mean,” a philosophy that was quite avant-garde for its time; this engine unit was in line with such a philosophy. A Roots-type supercharger enhanced the three-litre engine to yield a maximum output of 200 hp. This unusually powerful performance of the engine provided the pilot with adequate means to handle any possible situation. Complete with aggregates, our beautiful, hand-built replica will add to the glamour of every model car collection.